Size: 4.3" x 2.6" x 0.3"
This Canon LC-34 looks different to its predecessor LC-33 and makes use of a novel manufacturing technology. Dismantling the calculator reveals once again a clever usage of flexible circuit boards. The LC-display and the keyboard are attached direct to a very thin and flexible foil with printed traces. 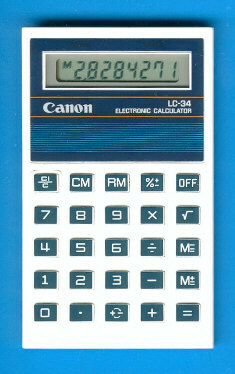 The sibbling LC-44 changed the design slightly but sports another calculator brain, the LC-34T added both a watch and alarm clock into a very similiar housing. © Joerg Woerner, March 17, 2004. No reprints without written permission.